For many applications the value of force measurement equipment is gauged by its ability to work as part of a system. Buildng the right testing system is a matter of selecting measurement tools and recording devices, that will efficiently accomplish your tasks. 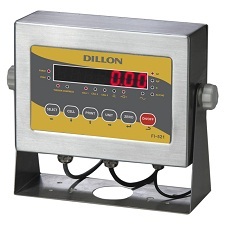 This is a sample of Dillon instrumentation and peripheral equipment that complete a testing system. The FI-521 is a bi-directional load cell instrument accepting both positive and negative load cell signals, internally performing the analog to digital conversion at 80 times per second. The FI-521 Indicator features a IP65 stainless steel enclosure for reliable performance in wet or dusty environments. Wedgelink captures Dillon instrument readings and sends them transparently to your application or directly to a file. Any program that allows you to manually enter data can receive data directly from Wedgelink. Your application accepts the data as if it were manually entered from the keyboard. Wedgelink was designed for those who simply want to turn on their computer and begin collecting data. It is extremely easy to use and will save countless hours of tedious data entry.